Add a little color to your baby nursery by adding decorative fabrics to hat boxes with fabric Mod Podge. Measure around the hat box. Add 1” to the length and 4” to the width. Cut the fabric to this measurement. Fold over one end of the fabric 1/2” and iron to secure. Glue the seam with a small amount of Fabric Mod Podge. Apply fabric Mod Podge to the seam or back of the hat box. Place the non-ironed edge onto the seam. (make sure the fabric is centered. You should have overhang on the top and bottom) Press with your fingers. Apply Fabric Mod Podge to the outside of the hat box, wrap the fabric around the box. Smooth with your fingers as you wrap. Add more fabric Mod Podge at the seam and press to secure. 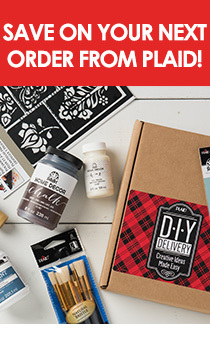 Add a ring of Mod Podge around the bottom of the box. Fold the over hang toward the bottom and secure into the Fabric Mod Podge. Repeat around the top edge.